Include the above image in your post and link back to my post. Blog about this week's topic. 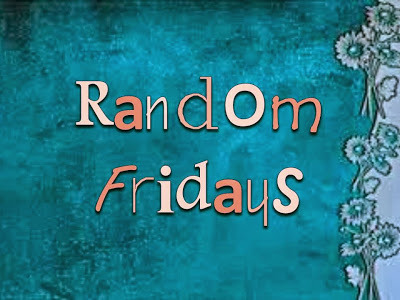 Add the link to your Random Friday at the bottom of this post. I'm a bit of a Shakespeare geek. I don't know all the crazy fun facts about him or his plays or adaptations/performances of his plays. But I love Hamlet, and A Midsummer Night's Dream and As You Like It are pretty great. My mom and I visited the Folger Shakespeare Library while we were in D.C. this summer, and I want to go back because we didn't have a chance to see their theater or the reading room. Sometime, I'd love to even sit in the reading room and page through all the books, articles, dissertations, and whatever else they have on Shakespeare. I'm also a nerd for Shakespeare retellings. If you're looking for a quality web-series, "Nothing Much to Do" is the way to go (although, fair warning, there is some strong language). ~And I also have it on good authority that I'll probably love Speak Easy, Speak Love by McKelle George. It's a Much Ado About Nothing retelling set in the 1920s. Love, love, love this post, and not just because I'm mentioned in it! Lots of good information in it, and recommendations.